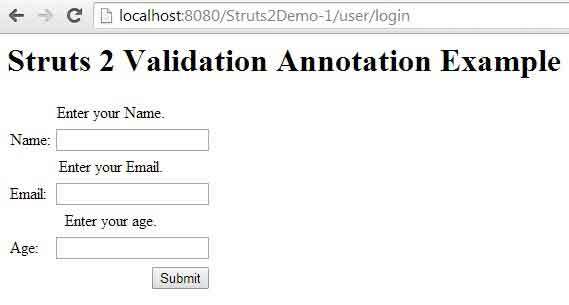 In this page we will learn how to validate a field using struts 2 annotation. 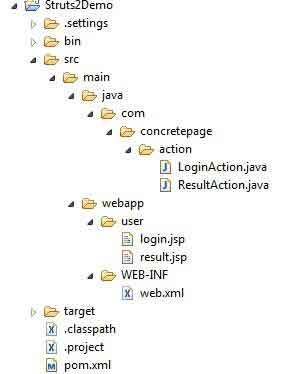 In action class use annotation to validate property and enable validation in form tag in jsp. This is all that we have to do for validation in struts2 using annotation. For example I have taken a user form which consist name, email and age. We will validate these three fields. I have used eclipse to develop this simple user form example. Ensure below software on your system. Validation of user fields is done on property level which is bounded with html field. In the example I have used below annotations to validate the user form. @RequiredStringValidator: Checks if any value is entered or not. @IntRangeFieldValidator: Checks if entered number is in given range or not, we need to define min and max attribute. LoginAction class is used to open user form page. In JSP page, form tag must have validate="true" attribute. Success JSP page will be as below. To run the struts 2 application, web.xml should be configured as below. Find the struts 2 maven dependency to run the example. I have developed the example using eclipse. The struts 2 project structure in eclipse will look like as below. Use http://localhost:8080/Struts2Demo-1/user/login URL to run the example. You will see a user form. To test validation, fill no field and submit. You will get the validation messages as below. Now fill the invalid data in email and age field. Check the validation message. Fill valid data in all field.